Door – Overall thickness of 127 mm for Class A door and 110 mm for Class B door. The protective layer consists of a steel door plate of 12 mm for Class A door and 9 mm for Class B door. Both door and frame are electrically welded to produce a structure of consistent strength. A fire resistant panel is also fitted to the back of the door, contributing to better fire resisting properties. 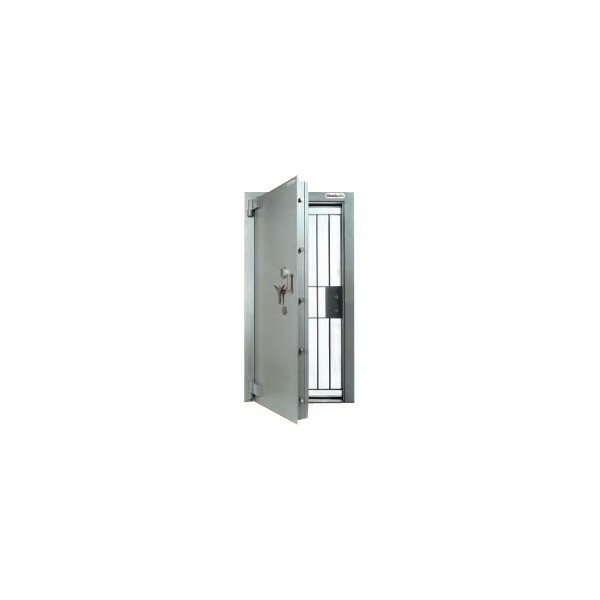 Boltwork – secured with heavy cylindrical steel bolts on the front edge of the door and additional fixed back bolts at the back edge of the door. 5 bolts for Class A door and 4 bolts for Class B door. All bolts are 32 mm in diameter and are nickel-plated to promote resistance against corrosion. All bolts engage behind solid rebates integrated into the door frame when locked. Locking – Both doors are secured with a single 3-wheel Keyless Combination Lock and an 8-lever double-bitted Key Lock as standard. Both locks operate independently of each other. Relocker – the Keyless Combination Lock for both doors are protected by a tempered glass relocker. The relocker will be activated when the lock is attacked. The relocker is designed to secure itself into a solid metal extrusion that forms part of the integrated boltwork system when triggered. 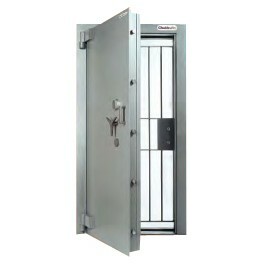 The relocker is in turn protected by a Chubbsafes drill-resistant plate. Finish – The door comes standard with a painted grey primer finish.